The EU looks like an empire. It walks like an empire. It certainly talks like an empire – listen to Mr Tusk. It treats its subjects like an empire. The former Commission President Mr Barroso said that it was an empire. And empires collapse. Is this one facing that risk? And if it is, how would we know? Introduction: Who are the ‘remainiacs’ and why do they make an icon of the EU? This report explains and deploys a famous general theory of the collapse of complex societies to answer that question. Using it to analyse detailed evidence of the EU’s own nature and history as well as the primary direction of European politics since 2000, it shows that the EU is already well within the zone of risk of collapse. It argues that faced with a structurally weak EU, Great Britain ought to act much more firmly right now and as it leaves it next year. The report answers a secondary question too. Why do ‘remainiacs’– those people who so passionately seek to block or to overturn the clear majority decision to leave the EU – so completely misunderstand the nature of the EU to which they seek to keep Great Britain shackled? The report explains and deploys insights from cultural anthropology to explain the structure of their beliefs. It suggests that this tiny but influential group has cult-like characteristics which make it see the world as a culture war. The majority who voted to leave should take note and deal with the ‘remainiacs’ accordingly. It is a self-evident truth that the hard and bitter efforts of the tiny but powerful cosmopolitan elite fraction who are trying to block or to neuter the decision of the 17.4 million ‘somewhere’ majority of leavers, display a disreputable disrespect for simple democracy. In The Road to Somewhere (2017), David Goodhart reckons that these cosmopolitan ‘Global Villagers’ who Mrs May described as “citizens of no-where” comprise 5% of the population and the ‘somewhere’ people, who know and care that they live in Britain, at least 50%. 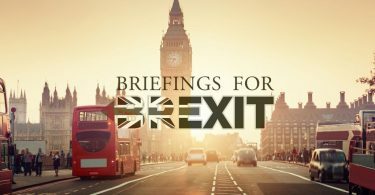 Furthermore, as Richard Ekins explained in an earlier Briefing (“Parliament’s role in Brexit: vital but bounded”) the likes of Kenneth Clarke, Dominic Grieve and Anna Soubry – lawyers all – place the reputation of Parliament in jeopardy. They do this by distorting perversely the message of Edmund Burke’s address to the electors of Bristol (and traducing Bagehot’s explanation of the English constitution) to justify playing fast and loose with procedural devices in Parliament, where they are over-represented. All this is troubling enough. But one of the strangest things about the ‘Continuity Remain’ or ‘remainiac’ cause to which such MPs adhere along with, it seems, a large majority of the university administrators, academics and their students who have expressed their views, is barely ever explored. What is not considered is the plentiful and swiftly accumulating political, economic and cultural evidence that the EU which the ‘remainiacs’ have suddenly elevated to be iconic and to which they seek to keep Britain chained, one way or another, may be at risk of collapse. As I shall explain in the body of this report, it is probably now well within the zone of that risk; and the nature of the EU means that when it comes, collapse will, rather than being graceful and gradual, more likely be exponential and quick, as it was in the DDR or the USSR in 1989-91. Why do ‘remainiacs’ not seem to grasp this possibility? They will, of course, reply that it is because it is not true. Therefore most of this report will show why the evidence strongly suggests the opposite, well beyond the balance of probabilities. But why do they think like this? For present purposes, I leave aside baser rent-seeking motives which are certainly germane for some (certainly among lobbyists, politicians and officials who are keen to secure lucrative EU contracts or posts) but may not be for those who are the idealists among the ‘remainiacs’: This is the so-called ‘Boot-leggers and Baptists’ syndrome, where rent-seekers free ride on the true believers (see A. Smith and B. Yandle, Bootleggers and Baptists: How Economic Forces and Moral Persuasion Interact to Shape Regulatory Politics, 2014). Rather, as someone with field research as a cultural anthropologist, I am struck by a more interesting and deeper cause to explain this remarkably selective vision. The ‘remainiac’ cause deserves its conflated name because it is so plainly not an empirically supported analysis of international relations. Rather, it is an intensely emotional aspect of identity politics. It holds its central belief in the virtuous superiority of the EU vision of the future in the same why that cults do, protecting it by ‘blocks to falsifiability’ that would have been very familiar to Sir Edward Tylor, the first Professor of Anthropology at Oxford and the first systematic student of the anthropology of religion in his 1871 masterpiece, Primitive Culture. Anthropologists have called this syndrome an ‘encapsulated’ belief system. So long as its defences are not breached, it has an armour-plated shell. But if a crack of doubt is admitted, it will shatter. Therefore, the ’remainiac’ disagreement with those who support the majority decision to leave the EU is, for them, starkly bi-polar: Manichaean. It is a culture war in which normal debate about the relative strength or weakness of evidence is just not possible. Naturally, the presence of this encapsulated epistemology does not mean that evidence should not be tested and weighed in the normal way, as this report will do. But with its accounts of his sleeplessness, stomach complaints and general upsets, Craig Oliver’s grieving, psychological autobiography of the referendum campaign (Unleashing Demons: The Inside Story of Brexit, 2016) shows well why there should be no illusion that the minds of ‘remainiacs’ will be changed by reasoned arguments. 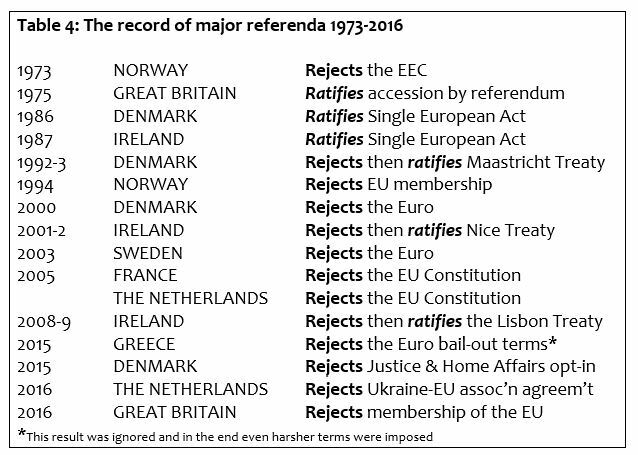 So at the same time that ‘Brexiteers’ may renew their confidence from the findings laid out below, they should note that ‘remainiacs’ must be fought politically in the same ways that one would any other cult. I offer some words of practical advice on this in the conclusion. For the moment, Mrs May seeks politely to negotiate with the EU. But it is futile because of the EU’s unchangeable nature which has much in common with the ‘remainiac’ world-view and which we will explore further, shortly. Meanwhile, frantic ‘remainiac’ virtue-signalling finds all fault for lack of progress with Britain, and none with the un-elected Brussels nomenklatura that, since his Kalends of March 2018 coup d’état, is now in practice run unchallenged by the master puppeteer, Martin Selmayr. His long-standing and consuming interest, stated in his first circular to Commission staff, is as Lord Protector and High Priest of the federalist faith (see J. Quatremer, “A very EU coup: Martin Selmayr’s astonishing power grab: How a bureaucrat seized power in nine minutes” The Spectator, 10 March 2018). Robert Tombs has consistently explained how today’s ‘remainiac’ attitude fits within a long and wearying tradition of declinist narratives among British elites; and that is a history which bears much repetition. But it is the ‘remainiac’ lack of interest in the actual nature and health of the institution which they now admire so extravagantly that is so extraordinary. Although, for the cultural reasons just indicated, the most committed enemies of the referendum result are imprisoned within their fierce confirmation biases and therefore may be beyond help, 95% of the population are not; and they need to know clearly just how sound the good sense of that majority of the British electorate was in its instinct to get out from under Mr Selmayr’s power and to take back control of our own lives and country. I doubt that Burke (or Bagehot, come to that) would have approved of the sly manoeuvrings of Dominic Grieve and his associates in the Commons and of their supporting cast, now shuffling onto the stage, of EU pensioners and other placemen in our bloated and diminished House of Lords; but I suspect that he would have rejoiced at the ‘wisdom of unlettered men’ who had the uncluttered clear-sightedness to act to defend British freedom when they were at last given the chance to do so in June 2016. So what is the EU, actually? When asked on 10 July 2007, Mr Barroso, who was then the President of the Commission, replied with a frankness that made his officials queasy. “We are a very special construction unique in the history of mankind. Sometimes I like to compare the EU as a creation to the organisation of empire. We have the dimension of empire. What we have is the first non-imperial empire. We have 27 countries that fully decided to work together and to pool their sovereignty. I believe it is a great construction and we should be proud of it.” Leaving aside the contorted logic and the Olympian omniscience about national motives, certainly the cap fits in the common sense of what empire means. The animating logic of the ‘project’ has broadly the same characteristics as the ‘remainiac’ creed, which is one of its scions. That logic has been determined since inception by the Vanguard Myth of the sacred duty of the Guardians to save the bovine masses from themselves and to lead them out of their dark caves into the light. Its practical implementation has been to draw powers from nation-states into the burgeoning centre by the one-way ratchet of engrenage and to lock those powers there into the acquis communautaire, never to return. ‘Subsidiarity’ within the EU has a uniquely top-down meaning. The nomenklatura alone decide which powers, if any, are devolved. The facilitating Monnet Method of moving obliquely and never wasting a good crisis to frighten and bounce la canaille into the next step of closer union, continues to be an entrenched tactic of faith. Thanks to his ever-running iPhone recorder, Yanis Varoufakis’s detailed documentation of how he was metaphorically water-boarded as Greek Finance Minister by every well-known name from Christine Lagarde to Wolfgang Schäuble, how the Greek people’s referendum result was contemptuously ignored, and how his Syriza colleagues were eventually seduced into complicity as Greece was sacrificed to keep the Euro and the federal ‘project’ on the road, is a chilling testimony to the old-fashioned methods of contemporary EU imperialism in action (Adults in the Room: My Battle with Europe’s Deep Establishment,2017). With only slight hyperbole, The Guardian described it as “one of the greatest political memoirs of all time.” Varoufakis has consistently warned the British government that normal negotiation is impossible with such a body. Not just difficult or complex: psychologically, structurally and politically impossible. Pay attention. He really knows. My goodness, how comprehensively the people have confirmed that prediction. They have responded to the EU’s own proffered democratic fig-leaf, the “European parliament”, with a qualified uninterest shown in declining rates of participation election by election since its inception in 1979 and rising fractions of disobliging anti-EU MEPs (which may tell us who is bothering to vote). In national elections, today, the technocratic centre-left/social democratic nexus which once seemed to be omnipotent is, in almost all continental countries, either crumbling or a smoking ruin. The drum-roll of collapse has been relentless in the foundation states of France, Germany and the Netherlands but also in Austria, Denmark, Sweden and Finland; and in the increasingly alienated East, the former Warsaw Pact nations from Poland to Hungary have heard a nastily soviet ring in appeals for ‘European solidarity’ over demands to submit to immigration quotas imposed by Qualified Majority Voting. And now Italy. In his blog on this site (“The Euro crisis: forgotten but not gone”), Robert Lee pointed out the inherent contradictions and consequent dangers within the Eurozone. From the Left, the Nobel Prize winning economist Joseph Stiglitz has argued (The Euro and Its Threat to the Future of Europe,2016) that it is a Bunbury: its structural contradictions mean that it cannot live and therefore it must be quite exploded if the ‘project,’ in which he greatly believes, is to be saved from it. Having struggled through the Snake and the Exchange Rate Mechanism episodes, Delors’ single currency démarche was the greatest demonstration of the Monnet Method in practice. But as member economies have diverged rather than converged, as was hoped for and expected, with advantage accruing to Germany and pain throbbing south of the Alps, it has spectacularly back-fired. 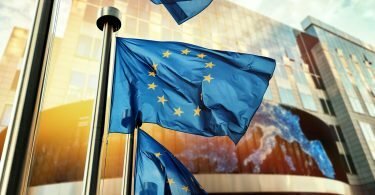 In retrospect, it can be seen that the much premature introduction of the Euro to try to force the pace towards political union, has been the greatest geo-political mistake of the Federalists, infecting the entire project with a wasting disease that remorselessly destroys its legitimacy. Italy has suffered for special reasons. With its idiosyncratic but successful post-war tradition of periodic devaluations of the Lira blocked by definition because of being within the single currency, the country has endured a quarter of a century of depression. Real incomes were higher under the Lira, and morally offensive levels of youth unemployment — around 50% — are a result. In the March 2018 election, the pre-Risorgimento geography of Italy resurfaced with cruel clarity. Those youth unemployment levels correlate quite plainly with Five Star performance in the south and in Sicily while fear of immigration and crime boosted the anti-EU vote in the rich industrial heartlands. The unqualified pro-EU vote clung on in places like Tuscany, where the Blairs and their redundant Ozymandian chums like to holiday. No doubt Brussels will make efforts to seduce an Italian equivalent of Alexis Tsipras in order to impose a fifth unelected Italian Prime Minister since the engineered ejection of Berlusconi. Perhaps they already have a beady eye on Luigi de Maio, the new young leader of Five Star? In the short term it may work to block the electoral message from the Italian people; but as we shall now explore in the next part of this essay, it is too late for such stop-gap tactics. The EU is beyond saving at this localised scale of action. More importantly for our purposes, this is too small a scale of analysis for the purposes of British readers who need to understand the dynamics driving the EU in 2018. They need a general theory applicable at large scale. It looks like an empire. It walks like an empire. It certainly talks like an empire – listen to Mr Tusk. It treats its subjects like an empire. They grumble rebelliously, as vassal-states do. Its self-regarding rulers, the Brussels nomenklatura, feather their nests generously just like their predecessors in function did in the USSR. José Manuel Barroso called it an empire. I think we may safely believe that the EU is an empire. And empires collapse. Is this one facing that risk? And if it is, how would we know? Since Gibbon examined the decline and fall of the Roman empire, auspiciously or ominously (according to preference) publishing the first of his six volumes in the year that the American revolution tapped the shoulder of the then current hegemon, the question of collapse has perennially fascinated scholars. Gibbon attributed the collapse of Rome before the onslaught of virile barbarians to its increasing decadence and the loss of civic virtue. It was a mystical sort of explanation. However appealing, it was impossible to confirm it from empirical data, and it has lost attraction for scholars who prefer hypotheses which are more concrete and analytically tractable. Jared Diamond has chimed with the current enthusiasm for ecological catastrophism which is to be found especially among disillusioned socialists seeking clever, new, ‘Green’ certainties in which to believe. He popularised resource depletion as a shallow sort of catastrophist explanation, with Easter Island as a prime (and much contested) exhibit. Another explanation offered for the collapse of complex societies is the opposite: being overwhelmed by new resources. This was originally deployed by archaeologists in simple pre-historic contexts but is also applicable for states possessed of oil, for example: the devil’s excrement as the Venezuelan oil minister once called it. Can Crown Prince Mohammed bin Salman escape this curse? Perhaps; but don’t count on it. Natural catastrophes of all sorts caused by volcanoes or climate change and especially by newly encountered diseases, have had a good, long run. They are often linked to inability to adapt or to insufficient response to circumstances, leading to induced social dysfunctionality, cultural paralysis or capture. The ‘failure to adapt’ explanation is tricky because it often presumes a priori what adaptation looks like, which ipso facto will blind the scholar to different sorts of adaptation actually happening in the evidence before his eyes. However Nathan Wachtel made a powerful case for profound cultural dysfunctionality related to a disease vector in La Vision des Vainçus to explain the grisly fate of the Incas after Pizarro’s arrival in 1532. Still other scholars have favoured defeat by more complex societies than those of the victim; or vulnerability to intruders because of their brute or innovative military superiority, or because of internal dysfunctionalities which subvert defence, or because of internal class conflicts (the Marxist input). There are other economic explanations as well. The problem with all these types of explanation is that, individually or serially, they get us no nearer to a credible and testable first order general theory of the collapse of empires. How handy that would be, because it would give us a test of the sort that the British people could urgently apply to the EU. Excitingly, I think that we possess just this, right now. Joseph Tainter is an archaeologist of the pre-historic American West and South West. In 1988 he published a study of the collapse of complex societies in the Cambridge University Press series “New Studies in Archaeology”. It immediately attracted academic attention among and beyond his fellow archaeologists. After a slow burn, it took off to become (for an academic book) a best seller, with 29 reprintings by 2017. Why? Tainter tested all the conventionally popular explanations of collapse against many case studies from all continents. This included Rome (of course), Minoa, Mycenae, the Egyptian Old Kingdom, the Hittites, Mesopotamia, the Maya, the Western Chou, the Chacoans, Peru, the Kachin, the Ik – and others – as well as his own original areas of research in the American southwest. In short, he was thorough. He found some theories to be more useless than others. His dissatisfaction led him borrow from investment managers and to apply their powerful concept of declining marginal returns to social complexity. This led to an elegant breakthrough in practical understanding. Fig 1 shows how Tainter uses the concept of marginal returns to plot the dynamics in the perceived benefits of increasing complexity. Let us interpret it through rulers’ eyes, as if we are those with power to allocate resource: so at the outset it is our perceived benefit that matters, since we control the flow of investment. As complexity is increased from C0 to C1, the marginal returns are strongly positive (to B1/C1). Wow! We need more of this! 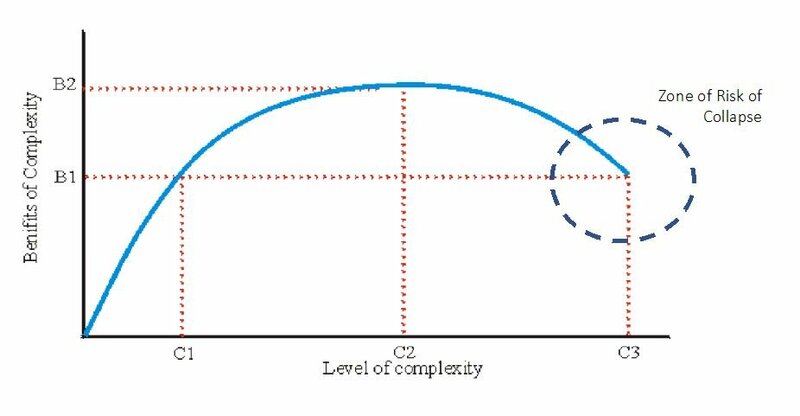 So logically, we double our stakes and much more investment in complexity continues (C1 – C2). But the returns (which may be economic, or military or – crucially – in social coherence and political legitimacy), while still positive, are slowing (B1/C1 – B2/C2) against the earlier turbo-charged increase in benefit. parties – our subjects – are now declining (C3/B1). A tipping point has been passed although we may not – almost certainly have not – noticed it. Why should we? We have the ideology and convictions and material benefits to us of that golden Phase One fixed in mind and we know that we are the chosen Vanguard that knows the right things to do. The dynamic has turned negative. The dragon we are riding has turned its head and it singes us with its fiery breath: for the greater the investment in more complexity at this point of our journey, rammed through because we Guardians know best, even as we know that many of our ignorant or stupid subjects are resentful and even mutinous, the more that investment is actually pushing our empire into the risk zone for collapse (around and after C3). We even have to force populations who make the wrong choices in referenda (as we judge them) to vote again until they make the right choices. Or we run out of patience and just ignore their votes. It is a hard and bitter paradox. I am sure that by now you will be ahead of me; but let me spell it out. First, a reminder that organisations shaped by Vanguard Myths really can collapse fast, have done so recently and that this can be irritatingly disruptive for status quo elites. In 1988, my friend Christopher Lee, who was at that time the BBC Defence Correspondent, and I, had a bright idea. Mr Reagan had stood at the Brandenburg Gate the previous June and in the climax of his historic speech he called for Mr Gorbachev to tear down the Berlin Wall. So we travelled around Europe to make some radio programmes in which we asked people what they thought Europe might look like if the Wall were to fall. Our programmes were well received by listeners but induced a furious response from many among the Great and Good in Britain. We were accused of scare-mongering, of sowing thoughts which might destabilise East/West diplomacy at a delicate time, even of undermining the morale of our troops at the Fulda Gap. Our motives were questioned. I recall that there was even a formal complaint to the BBC. Yet in November 1989, down came the Wall, in a joyous tumult. By 1991 the USSR had also collapsed, dead after a traditional three score years and ten human life-span. Exponential collapse really can happen in our times. As for us, well Christopher and I ruefully accepted Cassandra’s curse. In the minds of Jean Monnet and Arthur Salter (author of a 1931 blueprint entitled The United States of Europe), two friends and founding colleagues working together at the ‘progressive’ icon of the day which was the League of Nations, and along with other like-minded people (Ball, Briand, Hallstein, Spinelli, Count Richard Coudenhove-Kalergi the charismatic leader of the Pan Europa movement) the ‘project’ of European federation emerged as a reaction to the horrors of the trenches of the Great War and the wholesale annihilation of the flower of a generation in all combatant nations. So it shared these elements at conception (but in no other way) with its sibling, the USSR. In contrast to it, however, it had an elephantine gestation in the inter-war years when frank projects for a federal state, like the forgotten Briand Plan of 1929-31, crashed. Eleven times Prime Minister of France during the Third Republic and a co-laureate of the 1926 Nobel Peace Prize with Gustave Streseman, the Foreign Minister of the Weimar republic, Aristide Briand first ventilated his proposals for European Union in the League of Nations on 5 September 1929, elaborated them is his May 1930 Mémorandum sur l’organisation d’un régime d’union fédérale européenne, upon which in 1931 the League established a sub-committee, which he chaired. Briand died in 1932, and his strategy died too. It went nowhere as the Great Depression bit savagely. The lesson learned from this by the Founders was the importance of moving obliquely, with covered hand: the Monnet Method. So when building began in earnest with the Coal and Steel Community (the Schuman Plan) in May 1950, adding complexity on the ground, the benefits swiftly accrued in the founders’ eyes. Here are some major benefits for the proponents of the project in the ballooning complexity of the European project during its first forty years. prospectus which poisoned our politics for four decades). The ‘European Parliament’ was launched, adding much new complexity through a whole new layer of elected politicians and their ramified retinues, amply remunerated for shuttling to and fro from Brussels to Strasbourg and sometimes – why not – Luxembourg too. 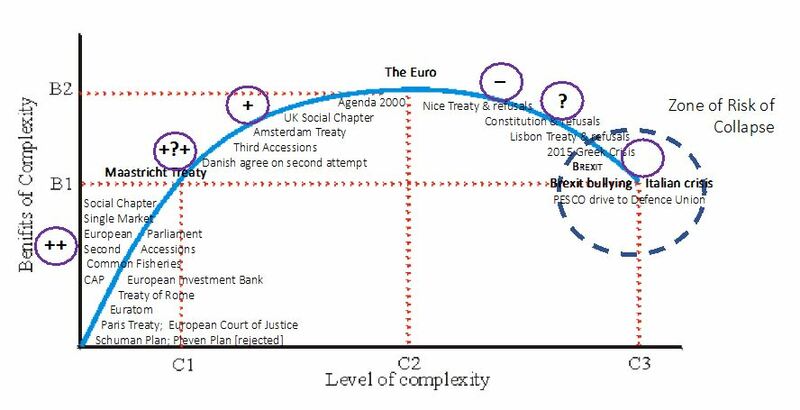 The moment of the Maastricht Treaty was at C1/B1 on Tainter’s diagram. It was the end of the phase of strongly positive marginal gain. But understandably and unsurprisingly that was not appreciated; and the speed and intensity of development continued to increase. Once Maastricht was secured, overriding all opposition, the ‘project’ began an era of frantic elaboration. The tentacles of regulation reached ever wider and deeper under such instruments as the Social Chapter and on the road to the single currency. But the gains came harder and were fewer; and the rebuffs became more frequent and bitter. After much struggle and manoeuvre, in 1999 the Euro was launched and that was the apogee in the life of the EU so far: B2/C2. Since then, further added complexity has produced negative marginal gains. Since the turn of the century, things have been steadily falling apart. Belief in the triumph of the will to promote the Vanguard Myth has spun a vicious circle: the ‘project’ drives forward ever more relentlessly; and in reaction the people become ever more disaffected, making it necessary to impose more instruments of control more stringently. Gains for the ‘project’ have become increasingly pyrrhic because of the cost in social alienation. A major watershed was crossed in 2005-6. Divergence between the elite and their subjects was acute over the push for a formal EU Constitution. The grandiose Giscard d’Estaing/Lord Kerr draft European Constitution was approved by governments but rejected by referenda in two core states, France and the Netherlands. The Dutch result by 62% to 38% was especially significant, coming in the oldest continental birth-place of freedom and free markets. On a visit to my late father’s home town in May 2005, just before the Dutch referendum, I realised for the first time that the EU was moving from being the source of a solution that I had known on childhood visits to being the cause of the problem for many who I met. This applied even in trivial matters, such as resentment at officious EU health and safety regulations. The Dutch took their revenge at their next chance, rejecting the next topic put to them in a referendum (on EU-Ukraine association, as it happened) in 2016; and in that intervening decade, the famous consensuality of Dutch politics shattered as Geert Wilders followed Pim Fortuyn, articulating deep fears and angers in traditional Dutch voters. But Guardians do not take no for an answer; and eventually the constitution was rammed through in light disguise as the Lisbon Treaty. The Irish bridled at that as they had at Nice; and once more they had to be pulled up, circled, whipped and spurred over the fence at the second attempt. Across the EU, the cost in terms of alienation mounted as increasing numbers of citizens, resentful of being treated as subjects, concluded that all this cost was nugatory because what it bought they did not want. In his study of the implosion of portfolio politics (Ruling the Void: The Hollowing of Western Democracy, 2013), the Irish political scientist, the late Peter Mair, documented how party membership halved across established democracies since 1980 with unprecedented levels of withdrawal in the 1990s. He argued that this alienation was associated with the consequences of government being decreasingly by consent and increasingly by regulation and de-politicised decision-making, which, he explained, is the EU’s way: “a protected sphere in which policy-making can evade the constraints imposed by representative democracy.” The 2015 Greek Crisis marked a nadir in this. Merkel’s uncharacteristically impulsive decision to open the doors to African, Middle-eastern and Muslim immigration was another watershed. Events like the mass harassment of 1,500 German women by crowds of mainly migrant men on New Year’s Eve in Cologne and Hamburg in 2016, suddenly confirmed to many previous politically acquiescent people that they really did not agree with elite projects to which hitherto they had resentfully acceded. For them, the marginal gains were plainly now negative. In Germany, the Alternative für Deutschland began to grow and became the leading opposition party in the 2018 election. Since 2015, either mass abstention, as in France, or active participation in single issue, often nationalist or ‘pop-up’ parties (like Macron’s En Marche or Italy’s Five Star Movement), has been a growing pattern. The March 2018 Italian election was accompanied by opinion polling which suggested that over three quarters of voters felt contempt for politicians and mistrust of their probity. It is only the most recent event in an accelerating trend. All this evidence of citizen rejection while the ‘project’ responds with further acceleration, has plainly taken the EU into the Zone of Risk of Collapse that encircles B1/C3; and that is where now it stands, shakily but defiant, belittling, bullying, hoping to dishearten the British in order to deter any other prospective escapees and intent on punishing us for our sovereign decision to leave the EU. It is hardly a sign of self-confidence. Sensing all this without Professor Tainter’s help, in 2016 the silent people of Britain defied their elite and, just in the nick of time as I have argued, we are getting out. Since the entire EU model is built on tamper-proof irreversibility, granting little importance to whole-hearted popular cultural and political legitimation in the terms that the people choose and value, this predisposes it to explosive collapse when collapse comes, as happened to the USSR before it, which had similarly autocratic wiring. The next Euro crisis continues to be the single most likely initiating trigger, but there is also a deeper, stronger tide running. The absence of full-blooded legitimation means that loyalty to the ‘project’ does not transmit across generations. The ‘remainiac’ case in Britain today does not even try to invoke loyalty to the EU in the wider population. It knows that this is a futile request. 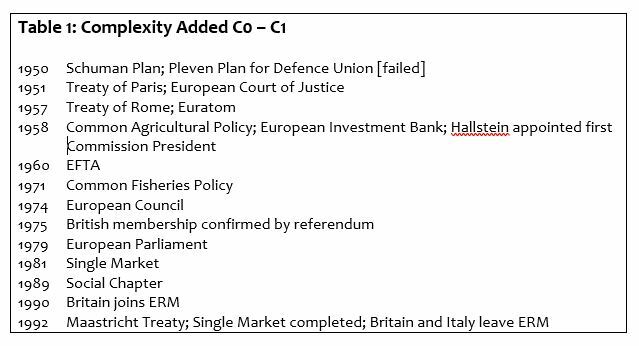 So ‘Continuity Remain’ is principally marketed as a transactional offer of self interest, just as ‘project fear’ was during the referendum campaign. It is an offer that then and now is not credible on evidence in its own terms and it rejoices in every scrap of negativity about our future to suggest that the greater uncertainly and danger lies in leaving the EU whereas, as I have shown, reality would indicate exactly the opposite. The ‘project’ is sixty one years old this month. Absence of cultural reproduction suggests that, like its older sibling, it should not expect to outlast a human life-span. In Tainter’s terms, people respond to sensed declining productivity of benefits from complexity quite logically, by opting to revert to a lower level of complexity commensurate with the public goods that they wish for and value. Sensible people apply Occam’s Razor and do not multiply entities beyond necessity. Hold that thought. Highly complex social organisations, Tainter reminds us, are recent in human history. If “loss of the umbrella of service and protection that an administration provides are seen as fearful events, truly paradise lost” then collapse must be seen as catastrophe. But with his archaeologist’s sense of time-scale, Tainter ends by reminding us that “collapse is not a fall into some primordial chaos, but a return to a normal human condition of lower complexity.” Collapse is not a synonym for catastrophe. It can be a salvation. 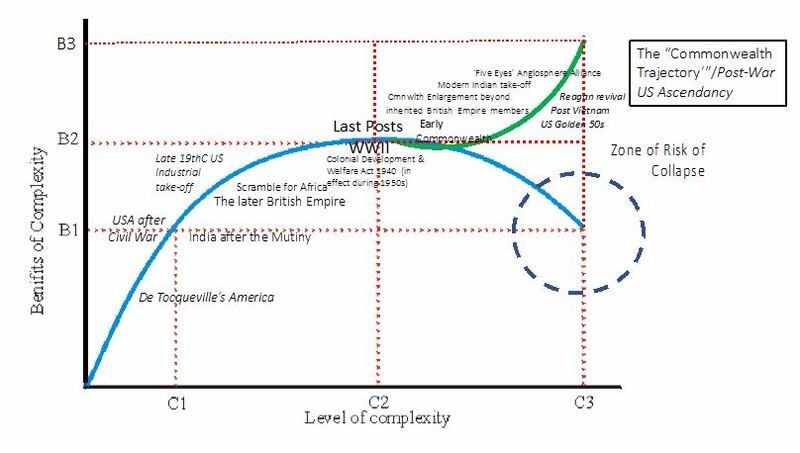 Think about what this implies for the logic of Brexiteers: “to the extent that collapse is due to declining marginal returns on investment in complexity, it is an economizing process,” the archaeologist writes. So on Tainter’s analysis, we see that far from being a failure to adapt to the progressive advance of history by ignorant or stupid or culturally primitive racists “driven by nostalgia”, as Sir Vince Cable has just informed us from his taxi-cab sized political base, the decision to leave an EU that on political, economic and cultural indicators is squarely within the zone of risk of collapse, may be – actually is – the most appropriate and prudent response. Tainter’s comprehensive review shows how a good many more times than you might think, collapse in over-complex structures is the preferred course of action for the many – but not for the few. Honourable socialists such as Frank Field, Kate Hoey and Gisela Stuart looking at the EU know this, as did Tony Benn before them, which makes it both sad and peculiar that many of their parliamentary colleagues, like Hilary Benn and his ‘remainiac’ dominated Select Committee on Exiting the EU, today, apparently do not. 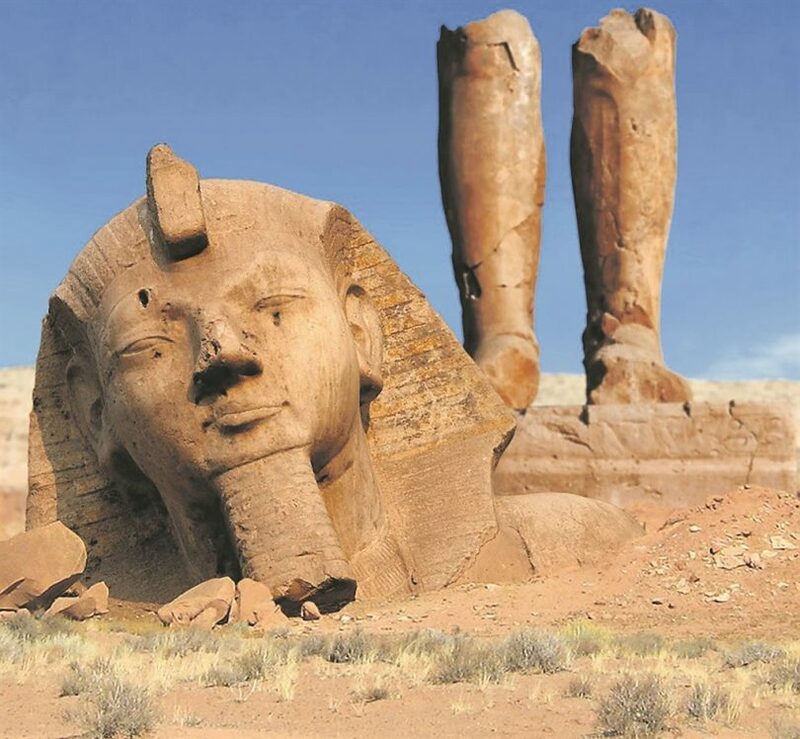 Is the collapse of complex structures such as empires, inevitable? Engels and Hobson thought so because they saw empires simply as a culminating stage of their model of ‘capitalism’: ruthless machines to rob seething subject populations of the surplus value of their sweat. This marxisante framing, with added moral propellant, has been transmitted in so many university lecture halls for so long that students of the “Rhodes Must Fall” generation hardly know of any other possibilities. But there are, as I know first-hand from my many years of research as an anthropologist and historian in Africa. Jean-Jacques Rousseau wisely observed that the most difficult thing in all of politics is to achieve legitimacy for power. This is what the EU and many previous empires, especially those whose rulers are also guided by Vanguard Myths which devalue the views of the subjects, have failed to do. So let us look briefly as two examples which have not followed the trajectory of Fig 1. In 1832, De Tocqueville’s Four Tests to explain the health of American democracy were (1) the presence of a common language, (2) a habit of local self-government, (3) an open political class dominated by lawyers (and one might add a cleverly self-correcting constitution within which they might argue) and (4) a sufficient bundle of shared moral values. After enduring a civil war, the continuing success of America today and the reason why it continues to be the world’s single most desired destination for poor and huddled masses yearning to breathe free is, in Tainter’s terms, because the marginal returns from De Tocqueville’s Deal stay broadly positive for the majority of the many as well as for the few. Accept the Deal as an immigrant and you still get a stake in the American dream. In a revealing survey of immigrants a few years ago, only Germans agreed when asked if in their view life would have been better for them had they stayed at home. If perceived benefits are on the trajectory B2/C2 – B3-C3, added complexity is not automatically problematic. Where academic Marxists miss out and deny themselves the excitement of understanding what imperial encounters were actually about, is in their fundamentalist reading of how the intellectual superstructure is determined by the material base. Set this 1859 article of faith from Marx’s pen aside and suddenly we can see how as well as bringing tangible benefits, the positive marginal gains from a colonial encounter can also be psychological – and by the way that is not ‘false consciousness,’ which is a pernicious and patronising excuse for lazy thinking. This was a realisation that took me years to grasp when I was researching the colonial encounter in central Africa. If people perceive increasing marginal gains then that is a shared stake in a complex structure. In my area of research, psychic control was within the spectrum, plus more expected benefits such as the impartial administration of colonial law and order, local self-government under Indirect Rule, full grain stores, improved peri-natal mortality rates or literate and numerate primary-school kids. Perceived and material benefits to ruler and ruled – different of course – together underpin legitimate power. That dynamic cannot be reckoned by only one simple, externally composed and externally applied arithmetic. Hard as it is to explain to prematurely closed minds, such was the nature of late colonial rule in many parts of post-war British Africa. Mandated by the war-time Colonial Development & Welfare Act of 1940, the bringing into effect of ‘welfare colonialism’ under the 1945 Labour government – the overseas analogue of creating the NHS at home – was a much more cost/effective application of aid than its latter-day successor. Yes, there was the Groundnut Scheme fiasco in Tanganyika which came, like modern ‘aid’ disasters, from ignoring local advice. But unlike modern aid workers, colonial officers had a stake in the relationship, knew their patches, spoke the languages and had legal powers too. Their efforts in those closing years of colonial rule in the 1950s, before the winds of change blew through the continent, were materially positive and popular with the beneficiaries across agriculture, education, health and, they were, by DfID standards, improbably cost-effective. I have met many among the people with whom I once had the privilege to live in deepest rural Africa who privately regretted the ending of that era. The residual good-will for British colonial rule, or the memory of it, endured. It was poignantly visible after British troops successfully liberated Sierra-Leone from the Revolutionary United Front in 2000 when, mission accomplished, they marched out of Freetown down to the warships waiting to take them away between cheering lines of Sierra-Leoneans imploring them not to go. All of this illustrates, very briefly, some large scale and some small scale reasons why, when it ended as a hub and spoke power structure, formal British imperial rule so successfully dissolved and morphed into a networked grid of power (shown on its flag), a shared enterprise called ‘The Commonwealth’. During the reign of HM the Queen, the Commonwealth has become one of the most solidly grounded global alliances of shared interests. No-where else and in no other organisation does such a kaleidoscope of different nations from all hemispheres freely associate in so many ways. They share what anthropologists would call a ‘thick’ cultural narrative (including cricket). Look, for example, at maps of the destination and volumes of email and telephone traffic from Britain. The ties that bind which stand out are to and between the Anglosphere and its allies. This makes the self-harm to Britain that was inflicted by our entry into the Common Market four decades ago so hard to forgive. The declinist and self-hating elite who sacrificed goodwill and put at risk our relations with Australia, Canada and New Zealand in particular made, as we now know, a massive miscalculation of future geo-political influence as between the Commonwealth and Europe. As we leave the EU, this makes the country’s debt to the Queen all the greater; for with her shrewd instincts about the national interest, her quiet and diligent life’s work, supported by the Royal Family, has been to nurture the Commonwealth regardless of here today and gone tomorrow politicians. Thank goodness. The outgoing Australian High Commissioner, Alexander Downer (whose father was High Commissioner in London when we kicked his country in the teeth in the 1970s), has given two recent BBC interviews in which he skilfully reminded us that the prodigal is still welcome, regardless, coming home. In summary, it took the clear-sightedness of ordinary British people in their millions, without academic help and against ‘expert’ consensus, to make the decision to demand a return to a national level of institutional complexity which is more stable and safer and legitimate in their eyes. 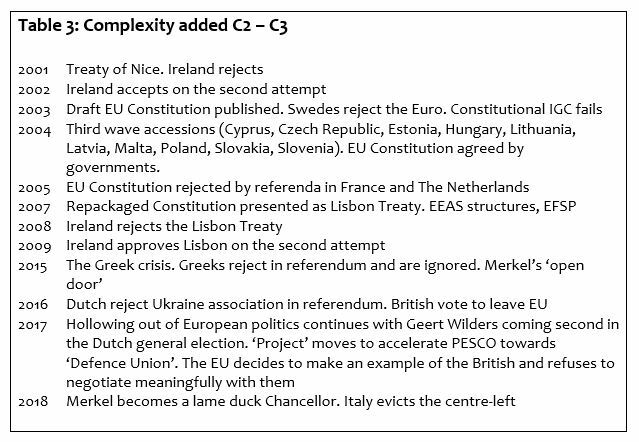 They judged that drawing back from what the evidence that I have reviewed here suggests is the cliff-edge of EU collapse, clearly provides a more favourable ratio of benefit to complexity than the threats and inducements offered to them by the rickety European ‘project’. They voted to take back control. Once free of those shackles, they then want to reap the positive benefits of a return to a global orientation, rooted in the added complexity of enriched Commonwealth and Anglosphere relationships. They wish to follow the Commonwealth trajectory from B2/C2 to B3/C3 in Fig 3. A coda. This essay had its origins in a March 2018 lecture which I gave in a course on Leadership and Command to my class of some of the brightest young officers in the French Army at the École Spéciale Militaire de Saint-Cyr. Both the analysis of the EU and the explanatory methodology were new to them and both led to thoughtful and probing discussion. A brilliant Bundeswehr officer in the class suddenly interjected that the declining marginal gain method might well apply usefully at a tactical military level too: after all, my students are there principally to study in order to vanquish. Ils s’instruisent pour vaincre is the motto of the place. So we chose an experimental case from the career of St Cyr’s founder. We looked at diagrams of Napoleon’s command systems; guided by reading Wellington’s Waterloo Dispatch we listed out the main events in the narrative of the battle; we put up a map on the board: and it works well as an aid to analysing the dynamics of 18 June 1815. (The fall of La Haye Sainte is B2/C2. The breaking of the Old Guard comes at C3). So my young warriors took away a practical new way to obey General Montgomery’s first law of warfare, which is to identify your enemy accurately. The impervious and encapsulated nature of ‘remainiac’ belief as explained in the introduction to this report makes reasoned discussion with it virtually impossible. That poses a challenge to the political majority because this is not an academic discussion made bitter, as Henry Kissinger once accurately observed, because so little is at stake. This is a bitter attack on the biggest winning democratic vote for any issue or any government in British history. That being so, like my St Cyriens, Brexiteers must study in order to prevail, for it is their democratic right and duty to prevail. Therefore they too need to follow Monty’s First Law and to identify the enemy accurately. Luckily, the self-blinding confirmation biases of their opponents prevent them from calculating correctly the correlation of forces or from judging accurately the dynamic character of either side. The Brexiteers can do both. I hope this essay may help them to do so even better. The winning side in the referendum to leave the EU also has the big but quiet battalions and (like Wellington) command of the higher ground. The Brexiteers would therefore also be wise to attend to Monty’s Second Law: maintain your aim! Gwythian Prins is the author of a prize-winning book in African colonial history. 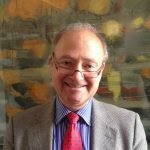 He taught history and politics at Cambridge for over twenty years, is Emeritus Research Professor at the LSE and since 2016 has been Senior Academic Visiting Fellow at the École Spéciale Militaire de Saint-Cyr.